I'm not being entirely serious here. These conventions don't automatically result in a bad outcome; many recent horror films have used them great effect, but it's a tough challenge to pull off. Go too far and things get silly, don't go far enough and there's zero fear factor. 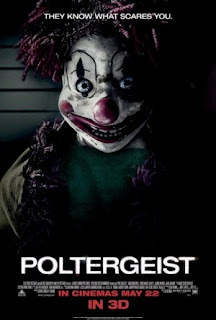 Poltergeist, a hideous remake of the much loved 1982 classic, manages to go in both directions; it's attempts at genuine terror fail miserably, but it's also utterly obsessed with goofiness and poor shots at witty humour. It gets to a point where even the characters stop taking incredibly worrying events seriously; I kept having to rub my eyes and wiggle my head about to see if I was actually watching the film and not the outtake reel. The plot literally just revolves around the Bowen family moving into a new house after the father Eric (Sam Rockwell) loses his job, and thus the tension and scariness (terms used very loosely) begins there. It's a lazy, formulaic script that makes absolutely no effort to balance the tone and mood of each scene or develop the plot in any meaningful way. The actors aren't really a saving grace either; performances across the board are generally very weak, particularly from Saxon Sharbino, and although Sam Rockwell has his charms, he ultimately becomes naught but the source of many misplaced jokes. As the film nears it's conclusion, all sorts of loud chaos begins - none of it remotely scary. I always believe that you should never try and produce epic Hollywood blockbuster results in a horror flick; the climax is overstuffed with so much CGI and loud set pieces that it becomes less a chilling horror and more a generic action film with some weird ghosts thrown in. Numerous sub plots arise, an onslaught of annoying and equally pointless characters turn up, and the film descends into pure nonsense. Alas, my friends: we have yet another reason why the industry needs to rethink the approach on the genre now.